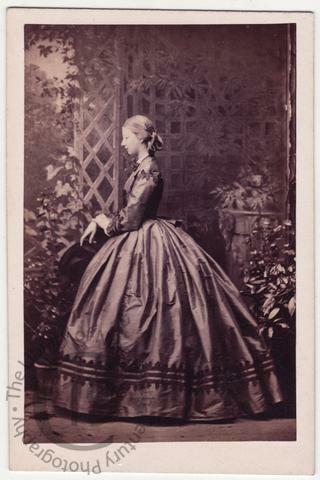 A carte-de-visite portrait of Princess Marguerite Adelaide d'Orléans, one of the daughters of Louis-Charles-Philippe-Raphaël d'Orléans, duc de Nemours [Duke of Nemours]. Born in Paris on 25 October 1814, he was the second son of Louis d’Orléans, afterwards Louis-Philippe I, King of the French. In 1831 he was elected King of the Belgians, but Louis-Philippe refused the crown in his son’s name. After the abdication of his father in 1842, Nemours, like the rest of his family, went into exile in England. He spent the years of his banishment trying to unite royalists and restore the monarchy, but after the fall of the Second Empire in 1870, he was allowed to return to France. Princess Marguerite Adelaide d’Orléans (1846-1893) was born in the Tuileries on 16 February 1846. She married the Polish prince Wladyslaw Czartoryski (1828-1894) on 15 January 1872 at Chantilly. She died on 25 October 1893, aged 47, at the Hôtel Lambert, rue St. Louis en l’Ile, Paris. Photographed by Camille Silvy of London. The Silvy daybooks show that Princesse Marguerite had sittings at Silvy's studio on three separate occasions: twice in 1863 and again in 1865.